I'm thinking # 3 – looks like a star – great for winter as with a dimmer in a dark room could look like a star gazer & in the summer could throuw off rays of light & create cool shadows as the dusk sets in the longer evenings. Number 3 without a doubt! 1 & 3. And 1 is cool that its German vintage. That's kind of fun & more interesting than telling people you got it at Anthropologie. But, I love anthropolgie. I think I'd get sick of looking at 4, though it is pretty! truly adore all of these, but i think #1 is my favorite — much more classic and will stay in style for the long haul! I agree, Valerie C…Number 1 is a "forever" chandelier! I am really draw to graphic, geometric fixtures right now, so my favorite is #4. Plus my kitchen is copper so that is a definite plus. I cannot stop looking at #2 – the glass shades are amazing! #1 – hands down. Part vintage, part mod, part classic, it'll never go out of style. 4 is cool, but might not give off much light. wow, I adore all of them! 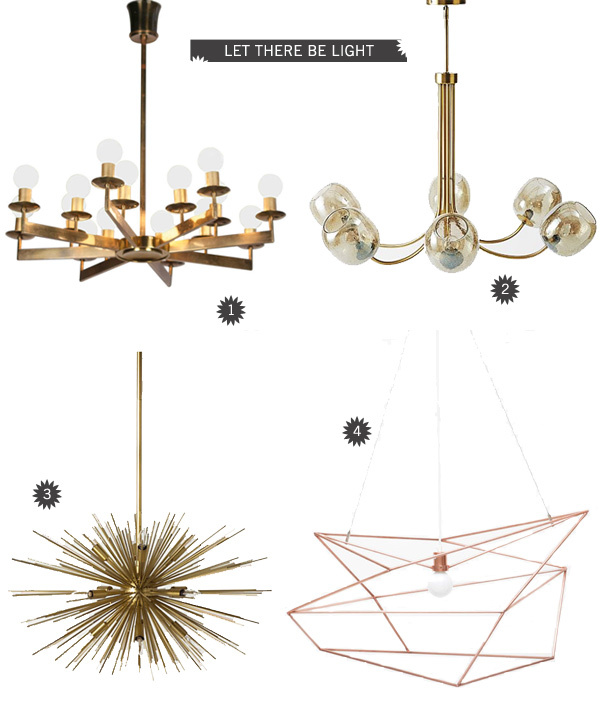 I'm a huge lighting fan as well so I could look at light fixtures all day 🙂 I've been wanting something geometric like #4 for awhile but I also love #3! I can't recall a picture of the table at the moment but if it's anything I can imagine I think #4 would be perfect! A great blend of form and function! I'm not going to lie i'm loving number four! I think #3 is the true classic of the bunch, it is stunning, and #4 is more like displayed art and does have long term potential, depending upon your lifestyle personality. #'s 1 and 2 I find less classic than boring. I love the geometric shapes of #4. It's stunning! #1 is by far my most favorite, modern still eclectic! Without checking the prices, I'm liking 3 and 4. That said, I always worry about strange shadows being cast below.